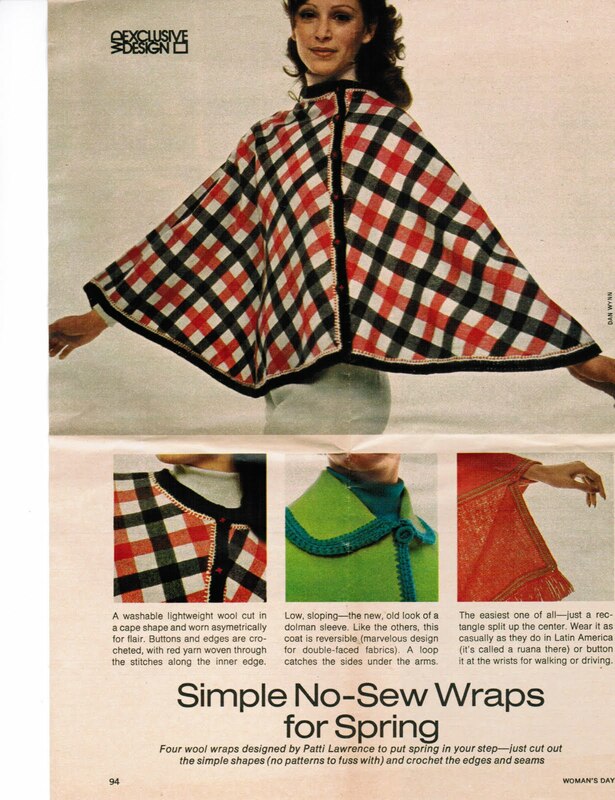 Plaid version: "A washable lightweight wool cut in a cape shape and worn asymmetrically for flair. Buttons and edges are crocheted, with red yarn woven through the stitches along the inner edge." Green version: "low, sloping, the old look of a dolman sleeve. Like the others, this coat is reversible (marvelous design for double faced fabrics). A loop catches the sides under the arms." The red version: "The easiest one of all - just a rectangle split up the center. Wear it as casually as they do in Latin America (it's called a ruana there) or button it at the wrists for walking or driving." Blue version: "The only coat the requires any sewing, and that's minimal (to secure the self fringe, make the belt, and if desired, put in pleats). Outline stitch covers fringe's machine stitch. I like how the chick in the bottom photo has Princess Leia hair, before Star Wars came out! Would love to have the instructions, how do I email you? My email is Lisa@vintagefashionlibrary.com. Just email me your address, and I'll pop them in the mail to you.